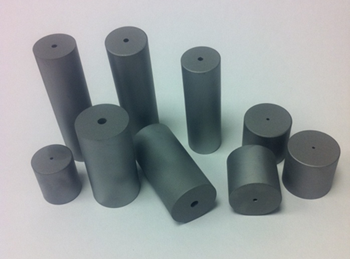 Dymet Alloys produce as-sintered tungsten carbide die inserts and blanks for use in hot and cold heading die tooling and forming tool applications. Inserts are made to order and can be supplied in different tungsten carbide material grades with up to a 25% Cobalt binder to meet our customers’ specific requirements to produce numerous bolts, screws and special fixings, in a variety of materials. We produce the die inserts and blanks in the as-sintered condition with the specific overall dimensions and special features our customers request ready for them to produce finished ground tooling. Our factory is equipped to make tungsten carbide heading die inserts and forging dies blanks in all sizes up to a maximum outside diameter of 250mm. We maintain good supplies of our tungsten carbide raw material in stock and aim to supply the as-sintered die inserts and blanks on a short delivery lead time as required. Our factory is equipped to make tungsten carbide heading die inserts and forging dies blanks in all sizes up to a maximum outside diameter of 250mm. We maintain good supplies of our tungsten carbide raw material in stock and aim to supply the as-sintered die inserts and blanks on a short delivery lead time as required. 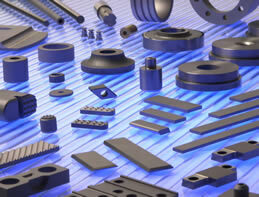 Talk to a Dymet Alloys expert about your specific application requirements.